If we will entrust our lives and our futures and our reputations to the Father, we will do well. 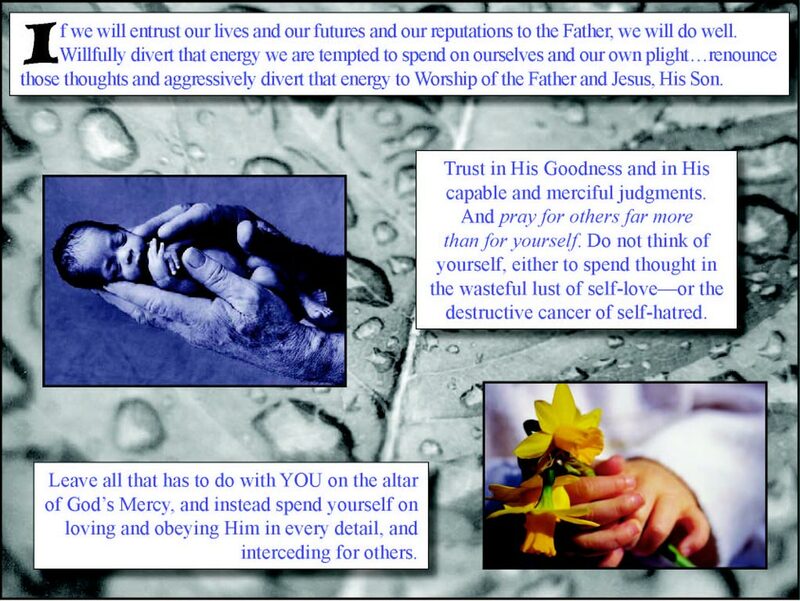 Willfully divert that energy we are tempted to spend on ourselves and our own plight...renounce those thoughts and aggressively divert that energy to Worship of the Father and Jesus, His Son. Trust in His Goodness and in His capable and merciful judgments. And pray for others far more than for yourself. Do not think of yourself, either to spend thought in the wasteful lust of self-love—or the destructive cancer of self-hatred. Leave all that has to do with YOU on the altar of God’s Mercy, and instead spend yourself on loving and obeying Him in every detail, and interceding for others.